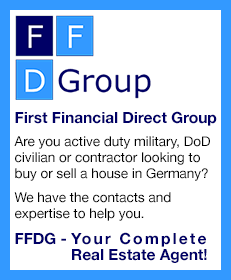 Military personnel in Europe have stateside-like banking services at their disposal. Services of the Community Bank and the various Federal Credit Unions include checking and savings accounts, ATM access, loans, credit and debit cards, online banking, automatic bill payments, 24-hour telephone access, bank-by-mail and currency conversion. Community Bank is proud to be part of the military communities it serves - not just as bankers, but as citizens, as well. The shared experience of living and serving with our military abroad gives it a common perspective with its account holders and unique insight into their financial needs. How does it express the pride it feels serving the overseas military communities? It begins by providing the highest possible level of banking service to its account holders. Then it makes available, free of charge, to all qualified individuals (not just account holders), key localized services such as currency exchange, wire transfers and local bill payments. It continues by providing a comprehensive program of financial education on its website, in its banking centers and local schools, and through outreach to its communities. Like most Americans, members of the military, in general, do not save enough for retirement. In fact, rather than save, many service members struggle just to pay off high-interest debt. The problem is so acute that the Pentagon has characterized it as a threat to our nation’s military readiness. To help address this concern, Community Bank is committed to providing service members with essential information about managing their personal finances. Increasingly, the internet is an important medium for communicating and conducting business. This is especially true for service members who often are geographically removed from family, friends and everyday retail services. In order to better serve the growing number of its account holders who bank online, as well as all visitors to its website, Community Bank offers an extensive range of educational resources and interactive tools. These include information that helps service members avoid credit traps and make better choices when borrowing money. Other resources include information on budgeting, paying down debt, saving money, setting financial goals and investing. It also makes available useful tools, such as financial calculators and checklists, and link visitors to other trusted websites and organizations that also are committed to helping service members and their families. In its banking centers, Community Bank offers financial readiness guides and toolkits to help account holders better understand their finances. Several major financial readiness campaigns that reinforce the importance-of-saving message run during the year in the banking centers. On-base, the bank partners with base commands and local schools to present key personal finance information to a variety of groups that include service members, general audiences and students. Moreover, it works closely with educators to develop lesson plans that introduce students to important financial life skills, and offers tools and materials that help parents engage with children on important topics, such as budgeting and saving for future needs. Community Bank is proud to provide the men and women of our military stationed abroad with the same level of financial services that Americans back home enjoy. Where possible, it has customized these services to address the unique needs of service members. One example is a Standing Payment Order*, which pays recurring monthly bills such as rent, utilities and insurance. Not only are bills paid automatically, the U. S. Dollars in the customer’s account are automatically converted to the payee’s local currency, saving time and money for the account holder. As another example, it offers wire transfers to stateside accounts and extensive online banking services that are especially useful for those who are deployed or otherwise unable to bank in person. Through the bank’s website, applying for a loan is quick and easy. In most cases, it can even provide applicants with an instant decision. While online, account holders can also view their current account statement, as well as the previous six months of account activity. The Go Paperless option saves time and money, and enhances security by foregoing mailed statements. Instead, it notifies account holders by email, when their new monthly account statement is available for viewing online. The Payment Imaging feature allows account holders to view images of both checks and deposit slips in the current and two previous statement periods. In addition to providing banking services to individuals, the bank also provides a host of non-retail services to the military that include financial logistics in support of operations, as well as currency conversion and disbursement to other on-base financial and retail outlets. Military life is marked by periodic moves. Military families routinely relocate every one to three years, and the call to deploy can come at any time. For these reasons, service members are often not able to bank in person. Community Bank has responded by making many banking services available online and by phone. Online, these services include greater access to account information, including past and current statements, the ability to view deposit slips and cancelled checks, pay bills, and transfer money to stateside accounts. The online experience can be personalized to provide account holders with helpful information about their specific banking center, such as locations and banking hours. In addition to providing customers with an unprecedented level of service, the bank is using technology to make its operations more efficient. Its consolidated banking system connects all of its banking centers, regardless of country. Not only does this help it operate with greater efficiency, it helps to facilitate the transition for their customers, when relocating from one country to another. The online loan application system significantly reduces the need for paperwork, in most cases, even providing customers with an instant loan decision. ** Customers can apply for a Community Bank loan 24/7 online. Just one more way it’s using technology to bring extra service to its customers and efficiency to its operations. Website - For further information visit the website at www.dodcommunitybank.com. **Credit subject to approval. Normal credit standards apply. Credit Unions are another part of the military banking structure. They are not-for-profit financial cooperatives owned by their members. All members of a credit union have equal voting rights, regardless of their deposit balance, and profits are returned to members in the form of such things as higher savings rates and lower loan rates. There are presently four Credit Unions serving the military in Europe. Andrews Federal Credit Union. 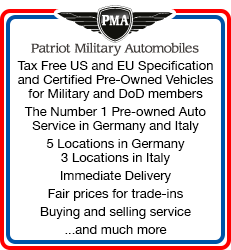 Tel: Europe Headquarters in Germany: +49 (0) 611-9787-600. Web: www.andrewsfcu.org. Branches in Brussels, Chievres, Schinnen and Wiesbaden. Keesler Federal Credit Union. RAF Lakenheath, Tel: (+44 (0)1638-533268, Web: www.kfcu.org. Branches in Alconbury, Lakenheath and Mildenhall. Pentagon Federal Credit Union. Web: www.penfed.org. Branch in the Azores at Lajes Field. Service Credit Union. Tel: 0631-351-2030, DSN; 493-4384 Web: www.servicecu.org. Branches in Ansbach, Baumholder, Garmisch, Grafenwöhr, Hohenfels, Kaiserslautern, Ramstein, Spangdahlem, Stuttgart and Vilseck. Authorized customers of the Credit Unions are pretty much the same as those for the Community Bank. One difference, until recently, was that Europe-based retirees could also use the Credit Unions. This has been changed and retirees can no longer open new accounts at the Credit Unions, though retirees who already had accounts may keep them. Retirees denied access to the military financial institutions do, however, have the advantage of the Defense Department's International Direct Deposit program.